The Rising Stars Download series of books, developed in conjunction with the National Association for Special Educational Needs, is aimed at Key Stage 3 and Key Stage 4 boys who are still having difficulties with reading. (I dare say a few girls might be interested too, but the publishers specify boys.) I chose to buy the one entitled ‘Download Motocross‘ as I was tutoring a teenage boy whose hobby was motocross and I hoped it would be the ideal book to encourage his interest in reading. The book starts off with a twenty-six page information section giving details of the sport itself, the equipment and kit, how to get started, the different people involved and how races are organised and run. Almost every page features coloured illustrations, most of which are photographs. The layout is perhaps more similar to that of a magazine than a reading book. Text is kept to a minimum on each page and is often presented in small boxes or single lines. The font is large and well spaced. Some sentences are extremely simple, for example, ‘You can join more than one club.’ Other vocabulary is more specialised, but because my pupil was a motocross enthusiast he was familiar with almost all of the terms and could often have a guess at the longer words. This did wonders for his confidence, and he did actually enjoy reading the information. He also began talking to me about his own experiences, so the book was a trigger for speaking-skill practice as well. Each book in the series contains a short story split into three parts. 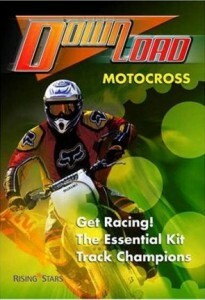 In ‘Download Motocross‘, ‘Ben’s Story’ begins on page 30 and part 1 covers just two pages. It is presented in black and white with illustrations and slightly more text than the first section of the book. Between parts 1 and 2 of the story is a double page on Junior Champions, again in colour like the other non-fiction sections. Following part 2 of the story are two colour pages on the ACU Academy for young motorbike riders. The final part of the story covers four pages, the third of which is entirely made up of text, but the words are kept simple: ‘At the end of the race Mum comes over.’ The final two information pages focus on The Motocross of Nations. On page 44 is a quiz composed of ten questions testing the reader on the non-fiction sections of the book. I was surprised by the amount of information my pupil had retained. Even if unable to answer a question, it would be a valuable exercise to look back through the book to try to find that answer. Correct answers are supplied on page 47. Following the quiz is a glossary of terms, and on page 46 further resources for motocross are listed, including books, newspapers and magazines, websites and DVDs. More recently I have tried using this book with pupils as young as eight who are not finding reading easy. On the whole this has been successful, although they would obviously need help with words such as ‘scrutineer’ or ‘sponsorship’. But they would generally react more favourably to reading a slightly more grown-up book than one aimed at a bright five or six-year-old. Other titles in the Download series feature snowboarding, rock climbing, fast cars, Formula 1, BMX and mountain biking, racing cars and sky diving. I would recommend these books to any parent with a child between the ages of eight and fifteen who is not taking easily to reading but has an interest in any of the subjects focused on. I would imagine that they should feature in any school library as well as upper junior and lower secondary classrooms to increase confidence in reading and offer enjoyment at the same time. No Comments on "Download Motocross"